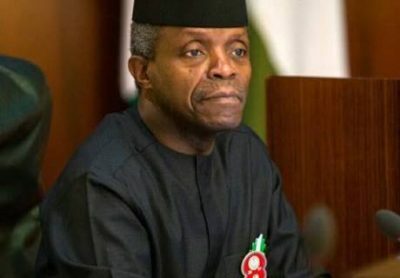 The Vice President, Prof. Yemi Osinbajo, on Saturday restated that the Federal Government had achieved a lot in all sectors of human development and democratic process. ￼Newsmen report that Osinbajo spoke at the 2017/2018 Barewa Old Boys Association annual lecture in Sokoto. ￼The vice president said that Policians had nothing to show for the lesson of the failure of the past administrations in the country as it happened. “There is a lot of impunity that have been defined to public office in Nigeria, especially grand corruption which had been sanctioned under the present administration. “Nigeria had in the past faced so much challenges of corruption in public offices with a lot of government money being stolen by individuals which the present administration blocked such instances,” he said. Osinbajo added that the present administration under leadership of President Muhammadu Buhari had recorded tremendous success in the areas of security, agriculture, judiciary, legislature, among others. “Also traders who are getting direct credit from the government to support their small scale businesses, they may say that we have seen some change,” he said. The vice president further restated that the relationship between the executive and the National Assembly remained in good condition, as the executive had never stepped in to the affairs of legislative conduct. “So, you will agree with me that a lot had changed at least with regard to political understanding,” Osibanjo added. “We are yet to cultivate the right attitude that is needed to stabilise the process for our advance in democracy. “The stunted growth that we are presently witnessing in our democracy is as a result of lack of discipline and non adherence to the basic tenets of democracy by our successive governments, over the years,” he said. Gov. Aminu Tambuwal and the Sultan of Sokoto, Alhaji Sa’ad Abubakar, commended the vice president for attending the event and the organizers for the choice of the state.